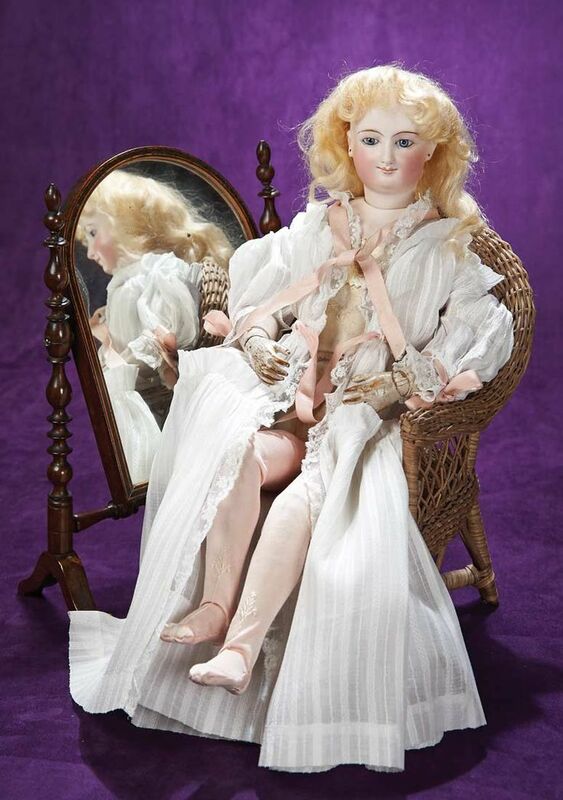 The first photo is of the doll as she appeared in the catalog. I didn’t buy her for her clothing…just a dressing gown…but for absolutely amazing face, and for the beautiful original wood body, which is especially rare in this size. I have always wanted a Smiling Bru French Fashion doll in my collection, but the face had to be just right . 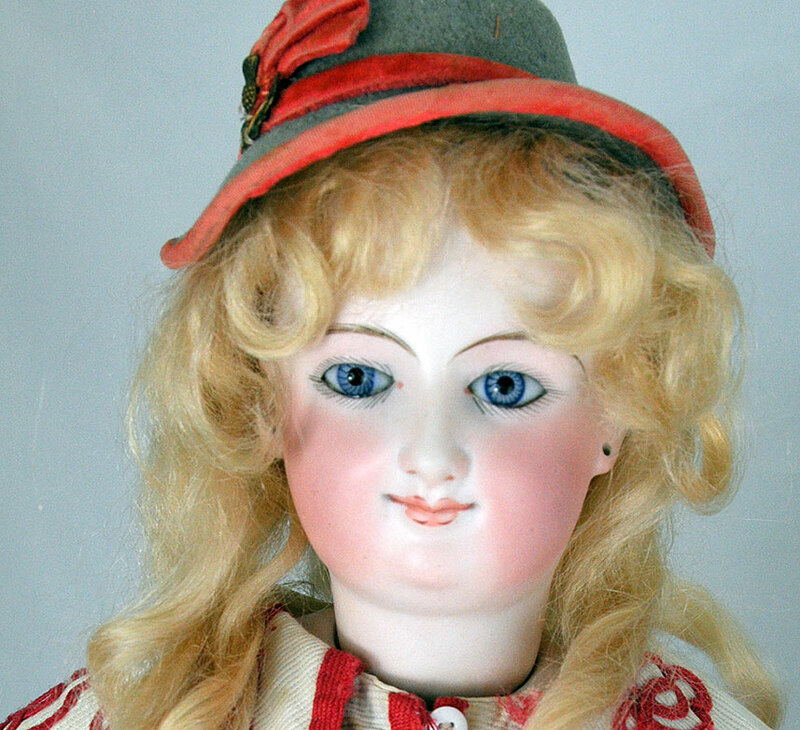 Sometimes the smile or the eyes is just a little off in these dolls ruining the beautiful portraiture painting. Well, for me, this Smiling Bru had THE face (Mona Lisa and Empress Eugenie all rolled into one). I actually had bid on this exact doll several years ago and lost her, so I was thrilled to see her up for auction again. But yesterday I saw her in my cabinet in the dressing gown, and I thought that she needed some French Fashion clothing that didn’t make her look like she was at her dressing table all day every day. So out came a French Fashion trunk, and I rummaged around and out into my hands popped a absolutely gorgeous white pique flared jacket with wide collar lapels and red soutache trim, which came from the Mildred Seeley collection (don’t you just love soutache trim when you can find it on French Fashion doll clothing?). I’ve had that jacket sitting in a trunk since I purchased it in 2002, since I just didn’t have the right size doll for it from the right era. The jacket is c. 1868, and the doll is a few years later..but I tried it on. And it looks lovely. So Smiling Bru, meet a jacket that has been waiting for the right doll for over 140 years! I threw on a jaunty hat (hmm…maybe not the exactly right color). In any event, happy 2016, and may it be filled with wonderful dolls, doll adventures, and doll friends! 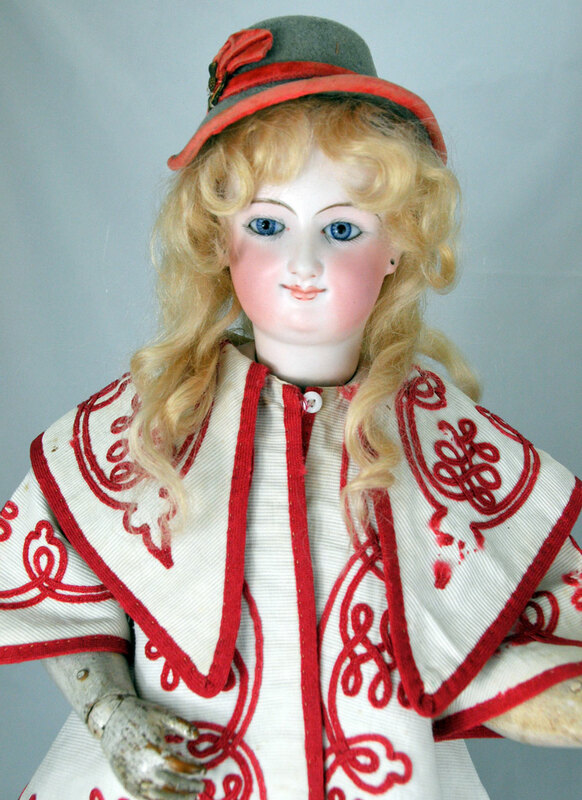 This entry was posted in Antique Dolls, French Dolls and tagged 1860s, antique dolls, doll auctions, french dolls, french fashion doll, poupee, theriaults. Bookmark the permalink.